Earlier this week, I wrote that the price you charge for your products and services is the signal that says more about you than anything you can do. I also shared the formula for determining what someone is willing to buy something for. Today, I'd like to go deeper into part of the formula, so that you can get paid more for what you do - even in difficult markets. Now, take a moment and think about the factors or contributors that your prospects and customers should use to establish the commodity value (or fundamental value) and the intelligence/enterprise value (the factors that you or your company bring to the table). Feel free to download the sheet below to use for this. We have no control over the left side (commodity) contributors of value! In my post Monday, I referred to Todd Sattersten’s ebook on pricing. 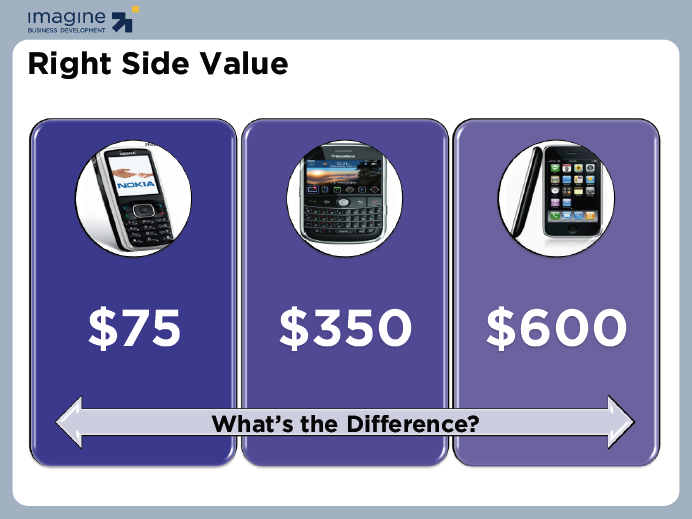 He discusses the choice companies have in setting their price and one of the interesting insights he provides is the difference in price and profit cell phone handset makers Nokia, Blackberry (RIM), and Apple experience. Why does RIM get 4 times what Nokia gets for their cell phones? Why does Apple get 50% more for the iPhone than RIM gets for the Blackberry? I can tell you this, the difference lies almost completely on the right side (the Intelligence/Enterprise Value) of the equation. It doesn't cost Apple 50% more to make an iPhone than it costs to make a Blackberry. And because of that, almost all of the price difference goes right to the bottom line. What are those contributors worth? Are they worth 1%? 5%? 15%? 50%? More? Whatever it's worth, remember that every dollar you earn from the right side of the equation is highly leveraged for you (it also works against you if you make price concessions). Your job is to focus all of your go-to-market efforts on supporting the "what's it worth (right side of the equation)" conversation instead of the "what's it cost (left side of the equation)" conversation.